This tutorial show how to set up an alarm using TradeStation’s Alarm class. Since the Alarm class in only accurate to the minute, I also used the Timer class to setup an additional alarm that occurs a specific number of seconds after the first. A video demonstration is included below. At the time of making this tutorial (September 2016) using TradeStation 9.5, release 15, there appears to be some unexpected behavior when using the Alarm class. for example, the alarm is sometimes fired additional times after the first trigger. In addition, when applying programs containing alarms to several charts on a workspace, some alarms did not fire at all. Hopefully, these issues will be fixed by TradeStation in due course. Consequently I created another alarm that solely used the Timer class. This appears to be more reliable. I demonstrate the ‘timer alarm’ in the second video below. The programs are available for download for a small fee or for FREE to Gold Pass members. Version: 9.5 (Update 15). There are major problems with update 14 running under Windows 10 (totally unrelated to this tutorial), with TradeStation continually crashing whenever I tried to open a workspace or to create a chart. Tutorial 115 is available for IMMEDIATE download for $9.95 by clicking the ‘add to cart’ button. After download the programs can be opened, you will be able to see the program code and modify it if you wish. After purchase you will be redirected to a download page, so don’t close the browser. _Tutorial115dev an EasyLanguage show me study. _Tutorial115-timerdev an EasyLanguage show me study. 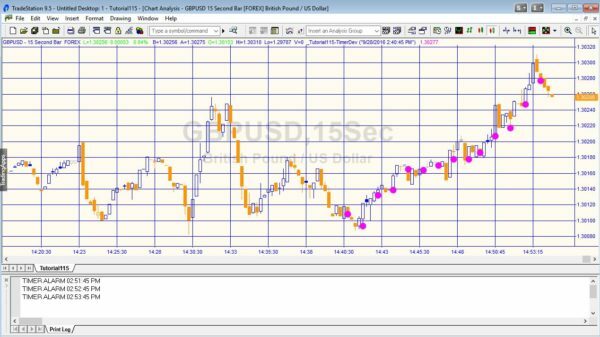 Tutorial 115 was developed for TradeStation 9.5 (update 15) and, unfortunately, will not work with MultiCharts.